Naxos has been busy launching an all-out campaign on behalf of Szymanowski’s violin works. A companion disc, played by Ilya Kaler, is devoted to the Concertos and has the Fitelberg orchestration of the Notturno and Tarantella. And now in the chamber sphere we have this recital by Miriam Kramer and Nicholas Durcan, which has two centres of gravity – the Sonata and Mythes. Kramer and Durcan have some decided views in this repertoire, ones that take them broadly to the edge of orthodoxy. Let’s take the Sonata. In the generous, perhaps over-generous, acoustic of Potton Hall – there’s audible pedal noise - we have here a very determined and measured account. A pretty standard first movement would take about ten minutes; that’s what Piotr Pławner and Waldemar Malicki take on Dux 02087. Lydia Mordkovich and Marina Gusak-Grin take almost exactly the same time on Chandos. Kramer takes a minute longer; she takes an equally slow tempo in the second movement and is still operating on a more measured basis in the finale. This is part of a well-defined and consistently held approach. Tonally she strikes a mid point between the incandescent grandiosity of Mordkovich and the more aristocratic restraint of Pławner, who prefers a more aloof profile and tighter rhythms – less rhapsodic in effect. Mordkovich’s guttural and febrile response is tremendously exciting but occasionally overpowering, especially in her boomy Chandos acoustic. The recording level also plays tricks on Kramer who sounds too loud at the start of the central movement – not enough tranquilo e dolce – and Durcan tends to underplay the rapture from time to time. Pławner’s finale generates heat, maybe too much in the piano part; Kramer sticks to her guns and prefers a measured course. Mordkovich happily bisects both positions. These pointers – or strictures – apply throughout. 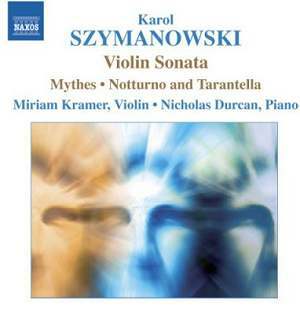 I find Kramer’s playing of the Notturno and Tarantella very inconsistent. The former is perfectly decent – a reasonable tempo, good tone colours – but she strikes a very deliberate pose in the Tarantella which is ruinously slow. One doesn’t have to whip things up à la Mordkovich (4:53) but to take six and a half minutes rather flies in the face of the Presto appassionato indication. Mythes is a much more difficult work to put across. She takes La Fontaine d’Arethuse and makes it more disembodied than usual but she’s less atmospheric than Pławner in Narcisse. Mordkovich is terribly fast in Dryades et Pan, Pławner’s better whilst Kramer plays beautifully in places but is inclined to be static. The other works conform more or less to these views except that Kramer is actually quicker than Pławner in the Romance. As one can tell Kramer and Durcan have strongly personalised views in this repertoire. My preferences are for the more aristocratic but sensitive Pławner and for the high voltage generated by Mordkovich.